This morning a rotting grapefruit made me appreciate the value of experiencing things from different perspectives. When I grabbed the grapefruit from the bottom of the fruit bowl my thumb sunk into a large, soft spot. The rest of the fruit looked perfect so I cut away the rotten portion and proceeded to prepare breakfast. 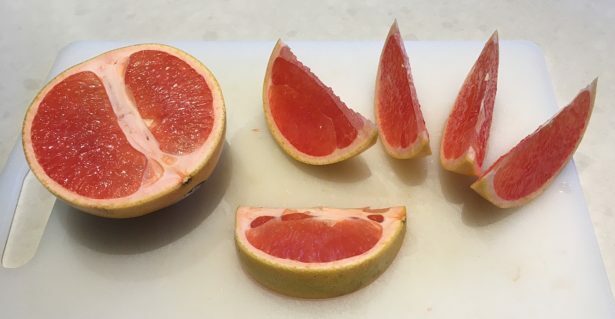 Because of the location of the rotten flesh I couldn’t cut and eat the grapefruit in the way that I usually cut and eat grapefruits (sliced in half, bisecting the sections so they can be scooped out with a spoon). Instead, I cut the grapefruit into wedges along the section membranes, like you might for an orange that you would eat off the peel. Holding the fruit in my two hands and biting into the flesh was visceral; a world away from using a spoon to transfer bite-sized pieces into my mouth. It even – and I’m sure I didn’t imagine this – tasted different not having the interference of an implement between me and my food. HOW I ate this morning’s grapefruit completely altered my experience. I marveled at the lesson I’d been shown and realized that this theory of HOW you approach things can be applied to many aspects of life. As an artist I considered how this theory might be applied to the viewing of artwork. The way in which you approach an artwork and the relationship that you build with the piece in front of you makes all the difference. I thought it might be fun to share a mini manual on art-viewing with you, from the perspective of one artist’s personal experience. I’m the kind of person who likes my experience of art to be somewhat exclusive. I like to have lots of open space and few external distractions. If you are able, visit galleries and museums on weekdays when the crowds are minimal and you don’t have to hurry along. NB: many museums have free or pay-what-you-wish nights but I steer clear of these times. It’s worth the price of admission to avoid being in the crush of a heavy and chaotic crowd that will adversely affect your viewing experience. If you’re on a solo visit, audio guides are fun and informative. When I’m with a friend, though, I prefer to skip the device and keep it personal, touring the gallery together and discussing the work and our shared experience (I’ve found that if my viewing partner and I opt for the audio guides, it turns into a tandem solo visit experience – not a bad thing, just different). Instead of taking several minutes to capture the perfect image on your cell phone (which never holds up to the real life experience), spend that time enjoying the piece, taking it all in without any filters obscuring the artwork. Unless I’m capturing images for a blog post (or photographing the title cards to research the work later) I keep my phone in my pocket. View the artwork from different angles and distances: look at it from across the room, from a few yards, and from a few inches away (yes, I’ve had more than a few gallery security personnel tell me to “STEP AWAY, PLEASE”). I love it when a piece woos me back, revealing different parts of itself from each location; that’s when I know I’m seeing something special. NB: Don’t try to flirt with every piece in the gallery. Your brain will melt. If a piece doesn’t grab your heart or your attention in a 10 second glance, move on until you find something that does. Don’t let the “fame quotient” bully you. There were whole sections of the Picasso retrospective at MoMA that I breezed through because the work made me feel nothing. Conversely, I couldn’t get enough of his 3-D guitar studies and sculptures – that was where I chose to concentrate the bulk of my visit. I’m a big fan of exhibition venues that have benches inside each gallery space. In fact, I think every gallery should have them. Spend time hanging with a piece – it’s not just an opportunity to rest your weary feet. Like eating a grapefruit with your hands instead of a spoon, viewing while seated and relaxed is another way of experiencing the artwork (it’s also fun perch from which to watch other visitors interacting with the work). Go on a second date. If a piece or an exhibit strongly affects you, visit it again. I’ve been known to go on third dates when the work really speaks to me (Kerry James Marshall – *swoon*). Sometimes we are fortunate enough to be shaken out of our routine by external circumstances. Sometimes – not often enough in my case – we deliberately choose to deviate and try a new tactic. Whether it’s viewing art from a different perspective, eating a piece of food in a different way, or [insert any quotidian aspect done differently here] it’s good to remember we have a choice; we don’t have to experience our daily lives on auto-pilot. We can choose to experience each moment with a conscious, open and curious mind. How do you experience? Do you defer to default or are you consistently curious? Please feel free to share an example of how your experience changed by approaching something from a different perspective.